This comforting Apple Spice Baked Oatmeal is an easy make-ahead gluten-free breakfast topped with sugar-free caramelized apples. A real must for the Fall Season… and a time saver! It’s that wonderful time of the year again, folks! Fall is here… and with it, all the goodies that make it magical, such as this Apple Spice Baked Oatmeal topped with caramelized apples. This is something that you can make-ahead, refrigerate, and bake before serving. It is made with simple ingredients such as old fashioned oats, apple pie spice, honey, reduced fat milk, an egg, an apple, vanilla, a heap of apple sauce, and baking powder. All you need to do, basically, is to mix all the ingredients, pour into a greased baking dish, and bake. Then top with apple slices caramelized with butter and honey, garnish with pomegranate seeds if desired, and voila! There you have a cozy and quite tasty breakfast that is ready to be devoured at home or to be taken along to work or school. If you prefer, you can make this the night before, bake, loosely cover to cool to room temp overnight, and reheat in the morning — or make, refrigerate, and bake right before serving. It pairs very well with a wonderful warm cup of tea: this Bigelow’s Classic Green Tea — which is grown at high elevation to extract the best flavor. It’s smooth and mellow on the palate, and all- natural, with clean notes of green melon and grass. 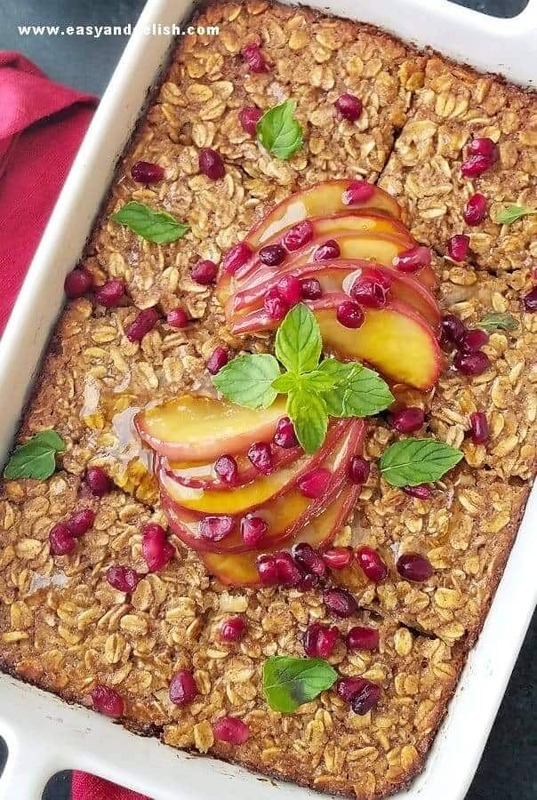 It pairs well with many dishes, including our Apple Spice Baked Oatmeal with caramelized apples and pomegranate. It’s a tea that complements our breakfast dish without overpowering it. I chose the decaffeinated version (my #1 choice) because I can drink it at other times of the day, warm my body up on those cool fall evenings, and still be able to get to sleep… all while benefitting from its healthy antioxidants. It’s quality tea made with excellent ingredients! 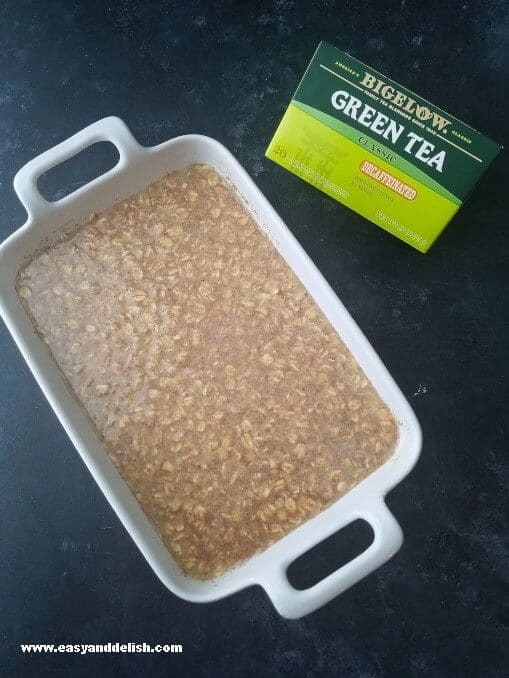 All the ingredients for our yummy Apple Spice Baked Oatmeal and its pairing beverage, Bigelow’s Classic Green Tea, are conveniently available at Walmart, requiring just one trip to your nearest store! As you can see, mornings just got easier, cozier, and more delicious! For more yummy inspirations and tea pairings, follow Bigelow on Facebook, Twitter, and Instagram. The prep for this recipe couldn’t be easier. Preheat oven to 375 F and grease a baking dish (either 8 x 8-inch, or 8 x 5-inch). In a large bowl, combine oats, apple pie spice, and baking powder. Set aside! Then, in a separate bowl, whisk together milk, an egg, honey or pure maple syrup, vanilla extract, and apple sauce until well combined. 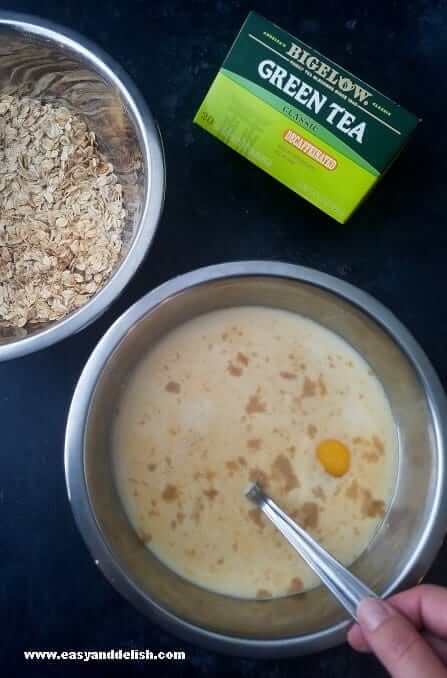 Gently stir the oat mixture with the milk mixture until incorporated. Pour into reserved greased baking dish. Bake for about 35-40 minutes or until a toothpick inserted in center comes out mostly clean. Let cool at room temp for at least 10 minutes before serving — or overnight, loosely covered. Meanwhile, prepare the caramelized apples. In a large no stick skillet, melt unsalted butter over medium heat, stir in honey, and cook apples for about 5-7 minutes or until golden brown. Top apple spice baked oatmeal with caramelized apples and if desired, garnish with pomegranate seeds. Serve with Bigelow’s Classic Green Tea and enjoy! It’s a breakfast made in heaven… one that can comfort us all season long! This comforting Apple Spice Baked Oatmeal is an easy make-ahead gluten-free breakfast topped with sugar-free caramelized apples. A real must for the fall season... and a time saver! Preheat oven to 375 F and grease a baking dish (either 8 x 8-inch, or 8 x 5-inch). 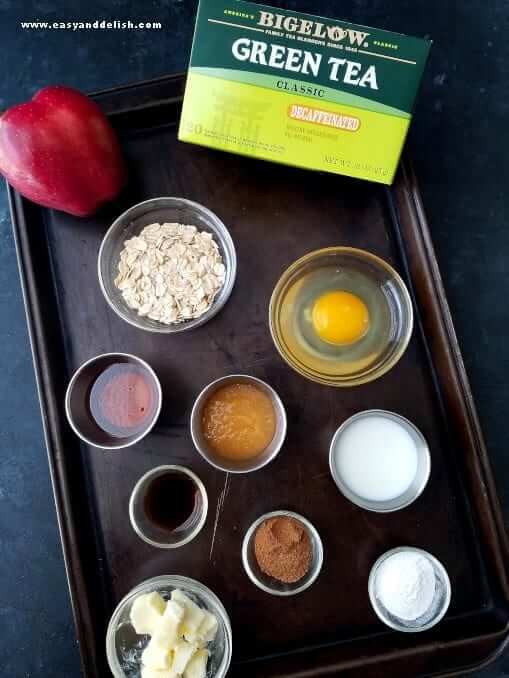 In a large bowl, combine oats, apple pie spice, and baking powder. Set aside! Bake for about 35-40 minutes or until a toothpick inserted in center comes out mostly clean. Let cool at room temp for at least 10 minutes before serving -- or overnight, loosely covered. Top apple spice baked oatmeal with caramelized apples. 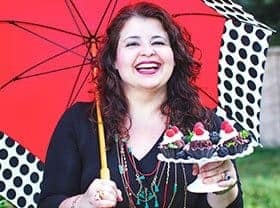 If desired, garnish with pomegranate seeds. 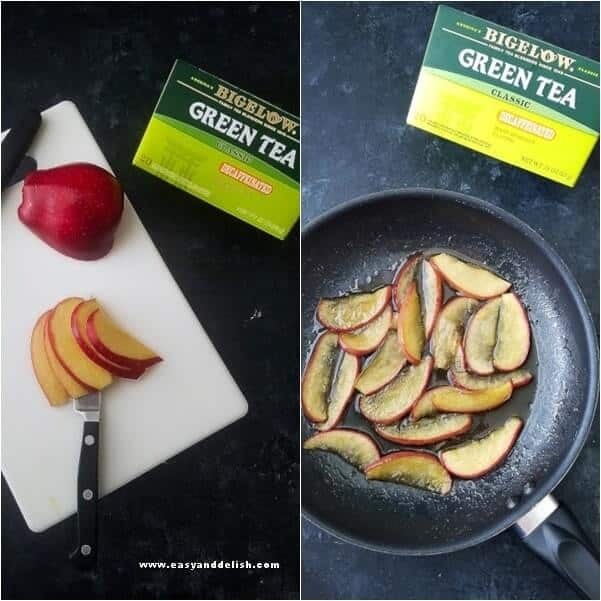 Serve with Bigelow's Classic Green Tea and enjoy! If you prefer, you can make the night before, bake, loosely cover to cool at room temp overnight, and reheat in the morning -- or make, refrigerate, and bake right before serving. Baked oatmeal is a traditional comforting breakfast casserole. This one is flavored with apple pie spice and topped with caramelized apples. To freeze, simply make the baked oatmeal, bake it, let cool to room temp, and then freeze it. Hey Densie…! 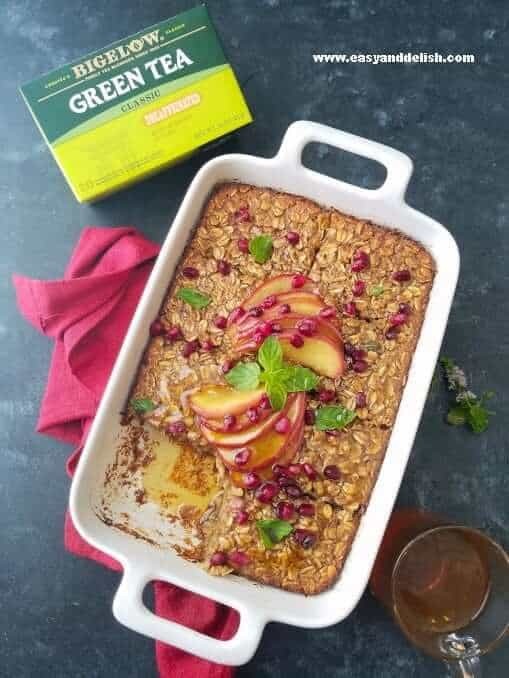 oats is one of most healthy food and this apple spice baked oatmeal looks soooo delicious & more yummy, best for our health….i will try to make this tomorrow breakfast….Thanks for sharing……! Thank you Madison! I made it for the first time days ago and already included it among my fave breakfasts. Enjoy! Tea or coffee, either way this recipe is a bowl of fall comfort!